Block-chain API provider Chain has raised new investment of $9.5m, bringing its total funding so far to $13.7m. The company, which helps developers build bitcoin apps by providing fast access to the block chain, received the funding from a number of investors including Kevin Ryan, Barry Silbert, Scott Banister, Homebrew, 500 Startups and Pantera Capital. The round was led by Khosla Ventures, which was started by Vinod Khosla, a co-founder of computer giant Sun Microsystems. With the announcement, Chain has also gained a new board member, Keith Rabois, who is part of the so-called ‘PayPal Mafia’, having formerly been an executive at the company. Rabois is currently a partner at Khosla Ventures and has previously held the positions of COO at Square and vice president of business and corporate development at LinkedIn. Some of those who contributed to Chain’s seed round of $4.2m have returned to top up the latest round, including RRE Ventures, Thrive Capital and SV Angel. Adam Ludwin, founder of Chain, revealed the new funding will be used to expand the company’s team and build out its product offerings. “The company is currently based in San Francisco and Los Angeles, but we’re moving everything to San Francisco in September, then we’ll be hiring pretty quickly,” he said. Ludwin explained that there are currently eight people working at the company, but he envisages the team growing to 15 by the end of the year. The entrepreneur, who invested in Vine in the early days of the video-sharing service, said he is principally looking to hire data and product engineers. He hopes this will enable Chain to create a “robust and reliable service” not just for startups, but enterprises and financial institutions too. Adam Ludwin (far left) with other members of the Chain team. The company currently has four or five product ideas in development and expects to launch two or three of these by the end of the year. “The product that the world sees right now is just the tip of the iceberg – it’s really just the foundation that enables what we really want to bring to market,” Ludwin said. He mentioned his team is also exploring developments in other digital currencies, specifically mentioning ethereum, ripple and stellar. “We are slowly, deliberately, but definitely bringing other currencies to our platform,” he explained. 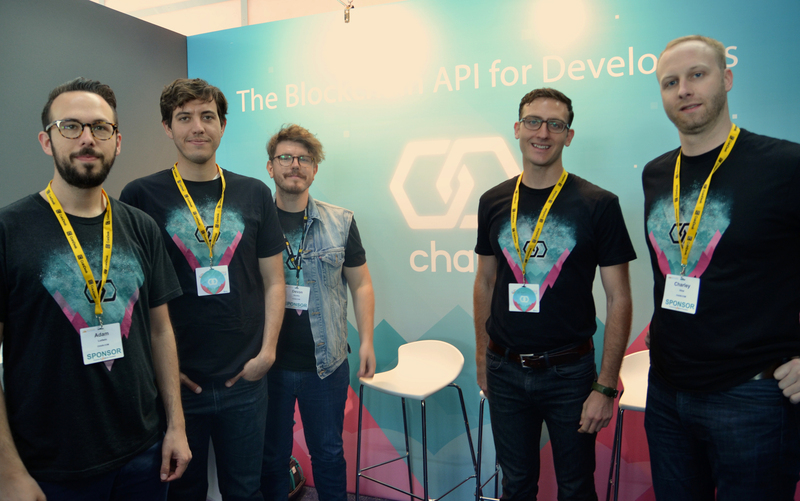 Currently, Chain is in beta, offering a free block-chain API to developers. Ludwin said the company will come out of beta “definitely by the end of the year, but probably sooner”. When an enterprise or financial institution starts to use Chain’s products at scale, a fee structure will be put in place. The company will also charge for premium features, which are currently in development. These products will sit on top of the API base Chain has built. Given the positive response received in relation to this project, the company is looking to make mobile development a large part of its operations going forward.